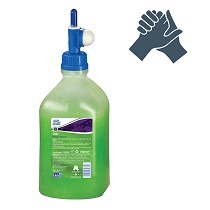 Keeping hands clean and protected when the job involves working in different locations or access to appropriate washroom facilities and running water is restricted, can be very challenging. 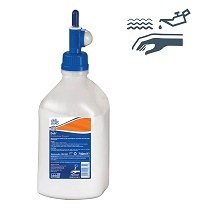 To maintain good skin health, prevent occupational skin disorders and stop the spread of germs, an effective hand hygiene system is essential, no matter where the job may be. 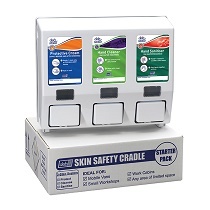 Deb’s Mobile Skin Care Cradle is a simple solution to enable hand washing, sanitising and protective skin care whilst on the move. An all-in-one compact system, the cradle is ideal for restricted spaces and when water is limited. To find out more about why skin care is important for mobile workers, the risks and what solutions are available, please click here to download a brochure. 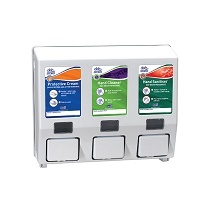 Includes cradle dispenser and a cartridge of protective cream, hand cleanser and sanitiser. 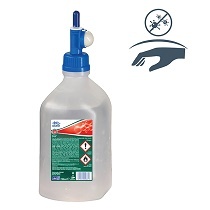 A unique skin safety solution for vehicles and areas of limited space.